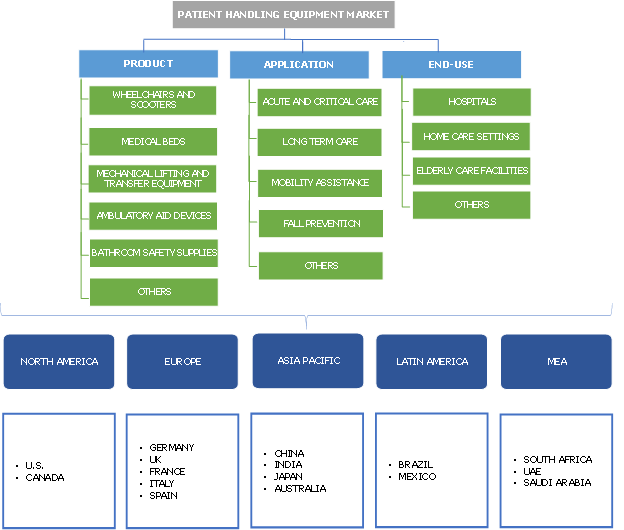 Patient Handling Equipment Market size was valued at USD 11.0 billion in 2017 and is expected to witness growth of around 11.2% CAGR from 2018 to 2024. Expanding geriatric population across the globe will stimulate the market growth in upcoming years. Older population contributes to higher percentage of hospital admissions and re-admissions. Aging population is also highly associated with reduced mobility. According to Merck Sharp & Dohme (MSD), about half of the adult population that occupies hospital beds are aged above 65 years of age. Thus, rising elderly population coupled with high risk of acquiring chronic diseases will surge the demand for patient handling equipment in foreseeable future. Inadequately trained caregivers owing to high training cost and duration will hinder patient handling equipment market growth. Issues faced by caregivers such as musculoskeletal disorders, sprains and spinal injuries can potentially impede patient handling industry growth over the coming years. Medical bed segment accounted for the highest market share of 26.9% in 2017 owing to increasing number of obese population, elderly population and rising number of surgeries. Medical beds available with wide range of customizations and advancements offer numerous benefits to the patient, enhancing patient care. Customizable features such as easy-to-adjust parts of bed, better patient positioning, adjustability, and other advantages will boost the business size. Furthermore, rising birth rate and booming healthcare expenditure should further drive segmental size in foreseeable years. Mechanical and transfer equipment segment is forecasted to grow lucratively at 12.6% CAGR over the forecast timeframe. Rising number of patients suffering from mobility issues due to disability or excess weight will increase the demand for mechanical and transfer equipment. Disabled patients need mechanical and transfer equipment in hospitals during treatment. With increasing number of advantages offered by the equipment owing to technology advancements will render high segmental share. Mobility assistance segment was valued at USD 3,123.8 million in 2017. With rapidly growing number of patient admissions affected with some form of chronic illness or mobility impairment, mobility assistance segment should witness substantial growth. In addition, escalating handling problems by caregivers will boost mobility assistance equipment adoption rate. According to American Nurses Association, 62% nurses reported development of disabling musculoskeletal disorders (MSD). Aforementioned factors will primary impact segmental size in forecast timeframe. Hospitals segment contributed to USD 5,119.7 million in 2017. The segmental size is attributable to capability of hospital facilities to provide advanced patient care along with high-end technology. California Hospitals approaches safe patient handling for secure employee and patient care purposes. Additionally, American Nurses Association mentions that hospitals must include ergonomic design principles to offer a safe environment care. 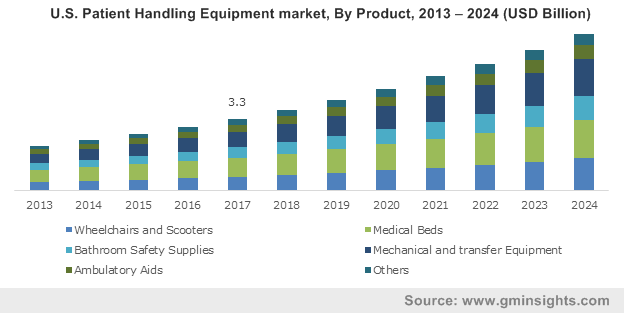 Above initiatives and infrastructure will augment hospital patient handling equipment market growth in the forthcoming years. Home care settings segment will foresee a significant segmental growth at 12.3% CAGR during the projected timeframe. Well-trained homecare workforce, increasing demand for homecare settings and personal care will act as primary factors for segmental growth. Availability of medical devices for patient transfer will increase customer preference for patient handling equipment in homecare settings. Above factors that enable better patient care in homecare settings will increase adoption rate of patient handling equipment in recent years. U.S. market dominated North America patient handling industry in 2017 with USD 3,264.8 million market size in 2017. Increasing geriatric & bariatric pool, numerous laws for safe patient handling coupled with rising patient population will act as high impacting factor for U.S. patient handling industry growth. According to American community Survey (ACS), in 2016, overall proportion of people with disabilities in U.S. was 12.8 %. Such trends will result into greater adoption rate of patient handling equipment in upcoming years. Japan market will foresee momentous growth at 13.6% CAGR over the forecast period. This growth can be attributed to increasing number of innovations in patient handling equipment, initiatives to prevent injury coupled with availability of sophisticated healthcare infrastructure. Moreover, increasing number of musculoskeletal disorders among Japanese nurses will pace adoption of such equipment, thereby impelling Japan patient handling equipment market in forthcoming years. Some of the major industry players operating in the global patient handling industry are Getinge Group, Hill-Rom Holdings, Invacare Corporation, Paramount Bed & Stryker Corporation among other players. Companies are adopting strategies such as new product launch and coupled with mergers and acquisitions to fortify their product line. For instance, in August 2016, Invacare launched ‘Simply SMART' powerchair control with innovative technology. This product introduction will enhance firm’s customer base. Safety concerns for nurses and caregivers in healthcare facilities during patient handling marked the evolution of patient handling equipment industry. Rising number of hospital admissions, geriatric population as well as disabled population are the primary factors that stimulated market growth. Furthermore, advancement of technology to encourage safe patient handling and rehabilitation will continue to increase the demand for patient handling equipment. In addition, implementation of legislations such Safe Patient Handling laws by various developed economies across the globe will remarkably spur patient handling industry growth in foreseeable future.